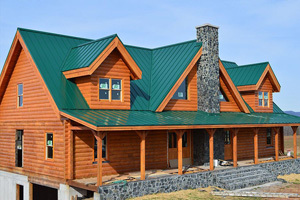 Metal roofing is not new, and neither is the standing seam metal roof. What is new is its popularity amongst homeowners. Originally, standing seam metal roofs were usually reserved for businesses and commercial buildings. That has changed, however, as more people are beginning to notice the contemporary appeal and durability of a metal roofing system. Standing seam metal roofs get their name from the way that they are built. They are constructed of metal panels that run from your ridge down to the edge of the roof. At the edge of each panel is a tall seam that connects to the next panel anywhere from ½-inch to 1-1/2-inches above the roof so it appears the seam is “standing”. They can be made of steel or aluminum, with painted steel being the most common. Standing seam metal roofs can come in a wide variety of different colors, which can complement contemporary to rustic style homes. The benefit of this is that light colors can be used on the roof that can reflect some of the light from the sun, and prevent superheating of the attic. In addition to their looks and the fact that they may help keep your home cooler, the biggest advantage to using this style of roof is its durability and it’s ability of shedding the winter snow loads. These roofs are built to last, so they don’t rust and most don’t fade in the sun, either. The fact that the seams of the roof only run vertically, not horizontally, and the fact that the seams are raised above the roof itself means that a roof’s traditionally weakest point is reinforced on these roofs. So while they can be dented by hail or pierced by a very heavy tree limb, they tend to last much longer than a standard asphalt roof – up to 50 years in comparison to the 20 to 30 years of an asphalt roof. The biggest downside to this style of roof is the impact it has on the falling snow loads from the roof to the foot of your home, deck, walkways, driveways, etc. This can lead to increased snow removal time and increased maintenace to items below the roof edges. Another disadvantage is limited experienced installers. While most roofers work with asphalt roofs, there are fewer who understand metal roof installation and metal roof materials. This means that it can be harder to find someone that is knowledgeable about the roof type. 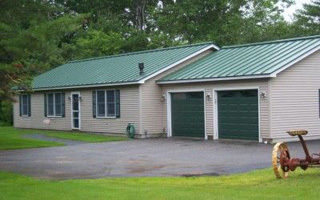 This style of metal roofing cannot be installed on flatter roofs, as well. This means that if your roof has a rise of less than 2 feet per 12 inches, you will need to choose a different roofing material.